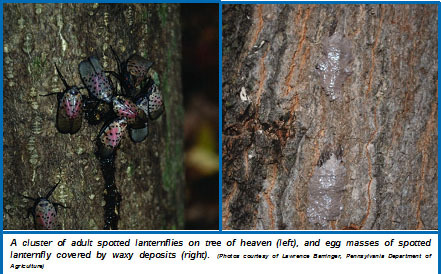 Spotted lanternfly (SLF) is an invasive planthopper native to China, India, and Vietnam. It was first detected in the U.S. in Pennsylvania in 2014, most likely arriving up to two years earlier as egg masses on materials imported from China. As of February 2016, SLF has been confirmed in five Pennsylvania counties, but due to its highly invasive nature, it appears to be spreading rapidly. SLF has a large host range (in Korea, over 70 plant species have been reported as hosts) and potentially could greatly impact the grape, tree fruit, plant nursery and timber industries in the U.S. Appearance: Adult SLFs are approximately 1 inch long and ½ inch wide when resting. The insects’ forewings are light brown to grey with black spots at the base and have a grey net-like pattern at the tips. The hindwings are red with black spots at the base, have white bands near the center, and have a black net-like pattern at the tips. The heads and legs of SLF adults are black, while their abdomens are yellow with broad black bands. When resting, adults fold their wings over their bodies and appear light brown to grey with black spots. Adult female SLFs have a red spot at the tip of their abdomens. SLF egg masses are 1 to 1½ inches long and ½ to ¾ inches wide, greyish-brown, covered with a grey, waxy coating, and contain 30 to 50 eggs. First stage immature SLFs (i.e., nymphs) are wingless and black with white spots. As nymphs mature, they eventually develop red patches, but retain their white spots. Host Range: SLF has a wide host range and nymphs appear to feed on leaves and branches of virtually any plant they encounter, often gathering in large numbers. In the fall, adult SLFs gather in large numbers on tree of heaven/paradise tree, willow, maple, birch, poplar, tulip poplar, ash, oak, grape, apple and stone fruit trees (e.g., cherries and plums). Tree of heaven/paradise tree (Ailanthus altissima) is a preferred fall feeding host for SLF adults, as well as a preferred mating and egg laying site. This plant is an invasive species native to China that grows in disturbed sites and along roadsides. SLF damage on grape, apple and stone fruit trees is of particular concern because these plants are important agricultural crops. Symptoms and Effects: SLF adults and nymphs feed on a plant’s phloem (i.e., food conducting tissue), sucking the sap from young stems and leaves, and reducing the plant’s ability to photosynthesize. Affected plants often have weeping/oozing wounds on their trunks that eventually result in greyish-black discolorations. Damage can lead to weakened, withered plants, and potentially even plant death. In addition, SLFs excrete large amounts of honeydew (i.e., sugar-rich feces) which can cover stems and leaves and build up on the ground at the base of plants. Honeydew can become colonized by sooty mold fungi (see University of Wisconsin-Extension bulletin A2637, “Sooty Mold”, available at http://learningstore.uwex.edu) giving leaves and branches a blackish coating that can further reduce photosynthesis and contribute to plant decline and death. Oozing sap and honeydew also attract other insects such as wasps, hornets, bees, and ants. Life Cycle: SLF has only one generation per year and overwinters as eggs in egg masses. In the spring and early summer, eggs hatch and SLFs go through four nymphal stages (called instars). Adults begin to appear in July and August. Males and females mate multiple times and females can produce one or two egg masses between September through November (or until they die from the onset of winter). Female SLFs lay egg masses on smooth-barked trunks, branches, and limb bases of medium to large-sized trees, as well as on smooth stone and other natural surfaces, and on man-made items such as yard furniture, cars, trucks, and farm equipment. Scouting Suggestions: SLF adults are poor fliers, but strong jumpers, and prefer to walk. Nymphs and adults gather in large numbers on host plants and are easy to find at dusk or at night when they migrate up and down tree trunks. SLFs are harder to find during the day as they tend to stay near the base of the host plants. Beginning in late April to mid-May, watch for nymphs on smaller plants and vines, and on any new growth on trees and shrubs. Watch for adult SLFs in late August through September, when they can be found in large numbers. Sticky tree bands can be helpful for monitoring for young SLFs, but less useful in detecting later stage immature and adult SLFs. From October through spring, watch for SLF egg masses (which can be very inconspicuous), particularly on tree of heaven.